For many writers, myself included, the name “Highlights” conjures up memories of childhood, of learning, of exploration. As a child, my younger brother and I would snuggle up with our mom and read Highlights magazine, its colorful covers always an appetizer to the puzzles and stories we’d find inside. As an adult, the company’s non-profit arm, the Highlights Foundation, stirs up many of those same emotions of learning and exploration, but with an additional dash of hope and a side of career aspiration. 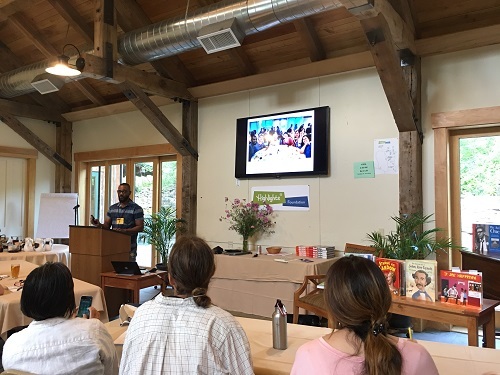 I aspire to be a children’s book author, and if you’re considering a Highlights Foundation workshop, you likely have a similar dream for yourself. I attended my first Highlights Foundation workshop as a James Cross Giblin Scholar, focused on excellence in nonfiction writing for children. On day one of the workshop, Master Class in Writing Nonfiction for Children and Young Adults, I knew I had made the right decision. 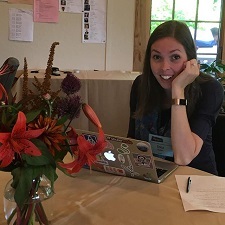 With insights from expert presenters, incredible feedback from a dedicated mentor, inspiration from other attendees, and just enough time to write and reflect, I came out of the workshop with not only new insights into how to polish my current manuscripts, but also a new picture book idea and first draft. As you navigate your first Highlights Foundation workshop experience, here are some insights from a newcomer who was in your shoes just this month! Make the most of the faculty. Whether your workshop includes one-on-one mentorship, critique groups, or some other form of facilitated growth, make the most of those moments. Come in with a plan on how you’ll optimize that time. What will you accomplish in three to four days with this dedicated feedback loop? At the Master Class workshop, each attendee had a dedicated mentor. My mentor, author and illustrator Don Tate, helped me realize that my first children’s book series, Entrepreneur Kid, could be reworked from its current state as an education market product to a trade series. During our 30-minute, daily sessions, he gave me pointed feedback on my writing, let me bounce a few book ideas off of him, and inspired me to dig deeper on certain aspects of my drafts, particularly around story arc development and emotional depth. I was able to get a lot out of those 30-minute sessions, because I came into each session with an agenda and key questions I wanted to answer by the end of the session. Receive open feedback on my manuscript. Discuss how I might edit it to be more ‘trade-ready’ [it was written for an education market]. Get advice on how my mentor would best utilize the workshop – specifically, what deliverables should I set for myself? Each day, I came in with two or three goals, and we crushed through them, and more. I’d suggest all workshop attendees have a strong understanding of what they want to get out of their mentor sessions and other forms of faculty-facilitated feedback opportunities. These are the moments when you’ll soak in the most industry-standard feedback on your writing! I never get the type of peace and quiet that the workshop allowed me. Juggling a full-time job and writing on the side is a handful. The workshop is your time to concentrate on your writing. If you’ve got a book project, dedicate yourself to it. If you’re looking for your next idea, spend your down time focused on that effort. Evenings alone in my cabin and break times in-between sessions were hours of inspiration for me. I haven’t been able to stay up that late since I was in college, but I was so inspired by the energy of the people around me that I couldn’t imagine using those minutes for anything other than writing. Dedicate yourself fully to your art while at the retreat, and you will be surprised and pleased with your progress. Those midnight hours were the tipping point for me in believing that I truly can be a children’s book author. Dig deep and pull up some emotions. By far, the most beneficial exercises of workshop week were those that helped me rediscover my childhood voice. We write for children, and we should be in touch with our childhood selves in order to reproduce authentic feelings in our work. In a whole group session, Don Tate conducted a middle school memories exercise, where he asked us to write a short essay based on our answers to about a dozen questions regarding our middle school experience. Questions started easy and got increasingly personal. A sampling: What was your favorite toy or game (describe the experience)? Describe your experience with middle-school sports. Who were your best friends? Adversaries? Describe a TV show you enjoyed or one that affected you in a negative way. What was your relationship like with your mom? Your dad? That exercise not only helped me dig deep, but it also inspired my next book project. The next morning, I woke up fired up to write a book about growing up without a father. During the workshop, I wrote and revised five drafts. Now, that was unexpected. Another session, led by author Susan Campbell Bartoletti, challenged attendees to dig deep into the emotional, personal, and intellectual connections they have to their work. At the end of the 10-minute exercise, which included writing a ten-line litany in which each line of the poem began with “I remember.” I was astounded that so many raw emotions had been pulled up through 10 lines about the day I was accepted to college. I worked with these raw emotions all week and it was perhaps the most creative writing experience I’ve had since high school. Do the same for yourself–you’ll be far from the everyday worries of life, and you’ve got a handful of days to take your writing to the next level. Give into your emotions and see where they take you. I don’t have enough space in this article to share the details of every lesson, but I know I’m going to be flipping through my notes frequently over the next few months as I polish and submit my manuscripts. Make sure to take notes when you attend–you may not know what will be particularly useful once you get back home. I recommend dedicating a notebook to your writing work, potentially even to writing retreats and conferences if you plan on attending multiple ones. I’m a sucker for comforts. When I’m at home, I have a standing desk where I write, and sometimes I make a pillow fort on my bed to get cozy for a seated writing session. Either way, I like my feet to be warm. When standing, that means my wool slippers, and when seated, that means winter-grade socks. If you have a small token of comfort–such as slippers, your favorite tea, a special computer mouse, or a light robe–that makes you feel at home and ready to write, bring it along! While I didn’t bring my socks or slippers, I was lucky to have brought a pair of comfortable flip flops I could wear around the cabin to keep my feet feeling at-home. 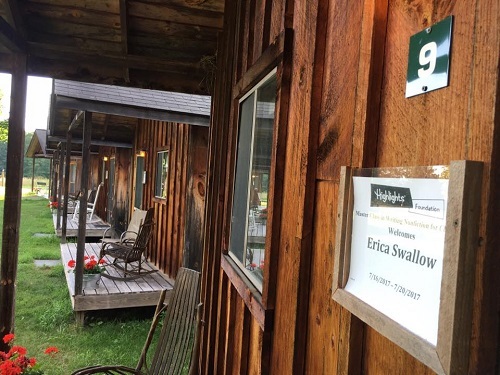 As soon as I checked into my cabin and before I started unpacking, I put my flip-flops on, and the familiarity made me immediately feel at home. It’s amazing how a small comfort can make a big difference. Don’t be bashful – share and stay in touch! The evening before the workshop ended, attendees and faculty had the opportunity to share up to four minutes of their work. I took a chance and shared the very personal picture book manuscript draft I had pulled together that morning– about growing up without a father–inspired by Don Tate’s middle school exercise. I spent all day in-between sessions revising my draft at Don’s advice that I work on it as much as I could while I was still deep in the raw emotions that arose from deep inside of me. By the time the s’mores and stories hour came, my story wasn’t yet polished, but I knew I had to get up and share. I made it through, and by the end, I had a few notes for myself on areas of improvement. Reading the manuscript aloud to an audience helped me find some of the awkward passages–it’s funny, because I had read it aloud to myself at least five times that day and missed those! Sharing puts us in a vulnerable spot, but it also challenges us to rise to the occasion. There is no growth without struggle. Don’t be bashful and miss your opportunity to share and improve. Get up on that stage and share something –something from the past, something you’ve been working on, anything! You’ll find that in sharing and listening to others share, you will connect deeper with those around up. Make plans to stay in touch–Facebook, email, whatever you wish. I met so many inspiring people who I am excited to grow with as writers. Hopefully you’ll have the same experience, or maybe those relationships will grow over time. But, to make that happen, it starts with staying in touch. In short, don’t forget to think of what can come after the workshop. Make connections that could last a lifetime by sharing and staying in touch. The Highlights Foundation workshop was a catalyst for me to plan out my career as a children’s book writer. On my way home from the workshop, I felt inspired to revisit my life mission and five-year plan, bringing my writing career to the forefront of that calling. Too often, we put our dreams on the back burner, but it is institutions like the Highlights Foundation that remind us that we only have one life to live, and if it’s our calling to write for children, we better get on that now! I hope the Highlights Foundation can continue to inspire others to act on the legacy they want to leave behind with their words–it was certainly nothing short of life-changing for me. Thank you to all of the staff, faculty, and attendees who made my very first Highlights Foundation workshop an absolute pleasure. I am already planning to come back! 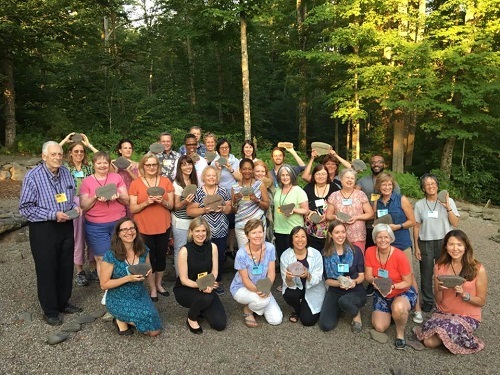 Faculty and attendees to the first “Master Class in Nonfiction for Children and Young Adults” gather in the Word Garden at the Highlights Foundation Retreat Center in Boyds Mill, PA.